Names of two legendary wizards of Pharaoh "who withstood Moses" (II Tim. iii. 8) by imitating "with their enchantments" the works of Moses and Aaron, though they were defeated (Ex. vii. 11, viii. 7). According to rabbinical tradition they were the two chiefs of the magicians at the court of Pharaoh who foretold the birth of Moses, "the destroyer of the land of Egypt," thereby causing the cruel edicts of Pharaoh (Soṭah 11a; Sanh. 106a). They said to Moses when he performed his miracles with the water and the rod: "Dost thou wish to introduce magic into Egypt, the native land of the magic art?" (Men. 85a). According to Midrash Yelammedenu, Ki Tissa (Ex. xxxii. ), they were among "the mixed multitude that went up with Israel from Egypt" (Ex. xii. 38) and aided in the making of the golden calf. They were the "two youths" (A. and R. V. "servants") that accompanied Balaam on his travels when commissioned to curse Israel (Targ. i. to Num. xxii. 22). They flew up into the air before the sword of Phinehas and made themselves invisible, until, by the power of the Ineffable Name, they were caught and slain (Zohar, Balaḳ, 194; comp. Targ. Yer. to Num. xxxi. 8). Numenius the Pythagorean, quoted by Eusebius ("Præparatio Evangelica," ix. 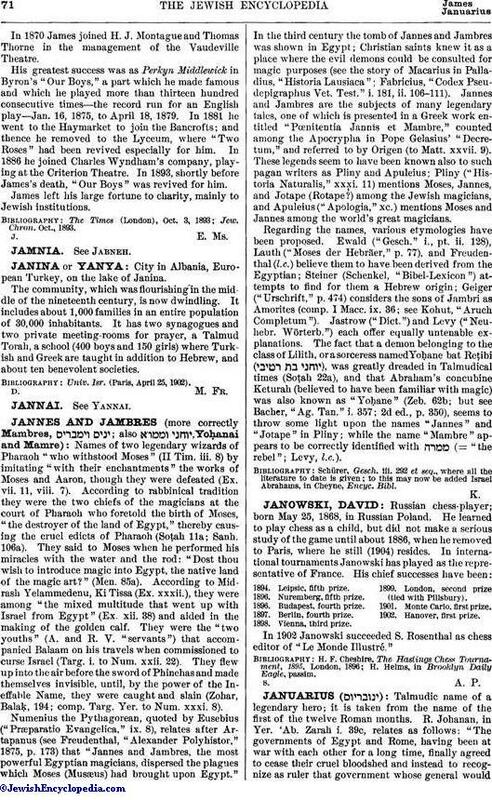 8), relates after Artapanus (see Freudenthal, "Alexander Polyhistor," 1875, p. 173) that "Jannes and Jambres, the most powerful Egyptian magicians, dispersed the plagues which Moses (Musæus) had brought upon Egypt." In the third century the tomb of Jannes and Jambres was shown in Egypt; Christian saints knew it as a place where the evil demons could be consulted for magic purposes (see the story of Macarius in Palladius, "Historia Lausiaca"; Fabricius, "Codex Pseudepigraphus Vet. Test." i. 181, ii. 106-111). Jannes and Jambres are the subjects of many legendary tales, one of which is presented in a Greek work entitled "Pœnitentia Jannis et Mambre," counted among the Apocrypha in Pope Gelasius' "Decretum," and referred to by Origen (to Matt. xxvii. 9). These legends seem to have been known also to such pagan writers as Pliny and Apuleius; Pliny ("Historia Naturalis," xxxi. 11) mentions Moses, Jannes, and Jotape (Rotape?) among the Jewish magicians, and Apuleius ("Apologia," xc.) mentions Moses and Jannes among the world's great magicians. Regarding the names, various etymologies have been proposed. Ewald ("Gesch." i., pt. ii. 128), Lauth ("Moses der Hebräer," p. 77), and Freudenthal (l.c.) believe them to have been derived from the Egyptian; Steiner (Schenkel, "Bibel-Lexicon") attempts to find for them a Hebrew origin; Geiger ("Urschrift," p. 474) considers the sons of Jambri as Amorites (comp. I Macc. ix. 36; see Kohut, "Aruch Completum"). Jastrow ("Dict.") and Levy ("Neuhebr. Wörterb.") each offer equally untenable explanations. The fact that a demon belonging to the class of Lilith, or a sorceress named Yoḥane bat Reṭibi ( ), was greatly dreaded in Talmudical times (Soṭah 22a), and that Abraham's concubine Keturah (believed to have been familiar with magic) was also known as "Yoḥane" (Zeb. 62b; but see Bacher, "Ag. Tan." i. 357; 2d ed., p. 350), seems to throw some light upon the names "Jannes" and "Jotape" in Pliny; while the name "Mambre" appears to be correctly identified with (= "the rebel"; Levy, l.c.). to this may now be added Israel Abrahams, in Cheyne, Encyc. Bibl.